Wait, but have you seen Birdman yet? I know I’m a little late to the party, but I finally saw it two weekends ago. You guys. I’m still freaking out. I don’t know the last time I came out of a movie that wired. Michael Keaton plays Riggan Thomson, a washed-up movie star famous for playing Birdman in the superhero franchise. Three movies were made, and he hasn’t been able to catch much of a break since the last one was released in 1992 (“Batman Returns,” anyone?). Now he’s attempting to make a comeback by writing, directing, and starring in a Broadway play at the St. James Theatre, all while losing his grip on reality (or is he?). I could spend this entire blog post raving about the cinematography alone. And on top of that, you’ve got those performances and that script and everything else. I knew going in that many of the takes were going to be long, continuous shots, but I had NO idea just how long we were talking. It’s filmed to look like one uninterrupted shot, and as far as my eye could catch, the whole thing might only be six or seven total. There are likely more tricks of the trade that I missed, but no matter, it’s impressive to say the least. They’re complicated shots, too – through gates, through the depths of the theatre, through the middle of freaking Times Square. During one scene, already a long way into it, we spend a few minutes in the rehearsal of the play on stage with an empty house. After Riggan walks away from that rehearsal and Sorkins his way back to his dressing room with Zach Galifianakis, we eventually make our way back to the theatre (mind you, it’s the same shot), and it’s now the first preview of the play and an entire audience has filled the house. It’s brilliantly set up to let your mind spin about what’s going on “behind the scenes” as they prep what’s coming next. Then you have the unfathomable cast. 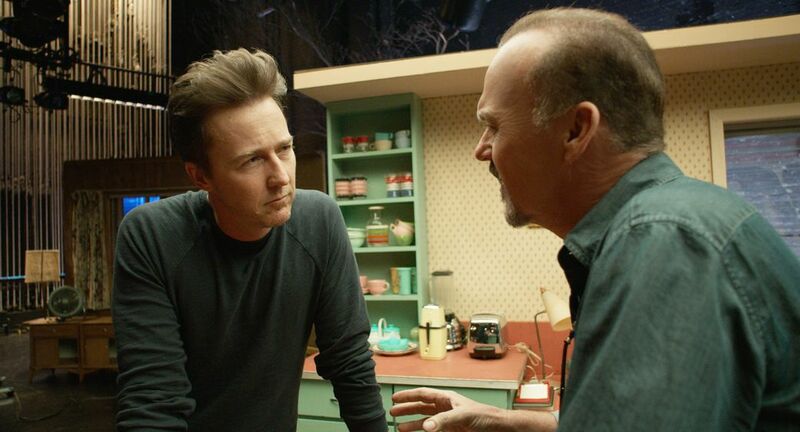 Golden Globe winner Michael Keaton, in a lovely life-mirroring-art twist, is himself making a fantastic comeback. Add in Edward Norton, Naomi Watts, Amy Ryan, Zach Galifianakis, and my girl, Emma Stone. All the performances are so charged, and between the intensity of that, the script, and the style of filming, my senses were turned up all the way; the movie made me feel heightened right alongside it. I think everyone can appreciate the filmmaking taking place here, although I imagine it particularly speaks to artists and those in the theatre. It’s quite the feat, and I highly recommend a viewing. I certainly will be partaking a second time. I had an enlightening conversation about “Birdman” with my bestie Dina. We both spent the duration of the movie thinking about Riggan’s mental state (when not thinking about the insane cinematography). Both Dina and I couldn’t help but follow along with a psychological perspective. It’s our go-to; I majored in Psych in college, and she is studying it in grad school as we speak, er…blog. So, early on we learn that Riggan has the ability to move things with his mind, Carrie-style. He has these powers, gifts, whatever you want to call them, which meant one of two things to us: either he’s having a mental breakdown and has lost his sense of reality (à la Natalie Portman in “Black Swan”) or we’re breaching into fantasy territory. But what we began to propose in our convo is that maybe there’s something else going on here, something not so black and white, however much we want to fit it into a category. Perhaps it’s not so simple as these two possible explanations. Maybe this is less about the psychological and more about the philosophical. Maybe…there’s a third option. By the end of the film, I don’t know if we’re even supposed to know what’s real and what’s not. It certainly left me wondering.